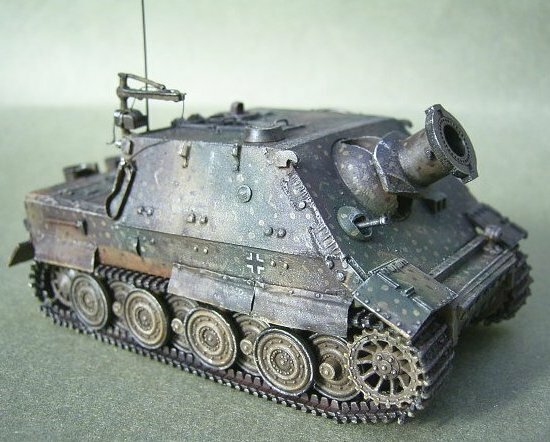 If a modeller wants to build a 1/72 replica of the Sturmmörser "Tiger", which was a rare (only 18 pieces were produced in the late 1944) and strategically insignificant but as such a fearsome and potent vehicle, he needs to base the work either on the rather crude AMC kit or on a resin kit. 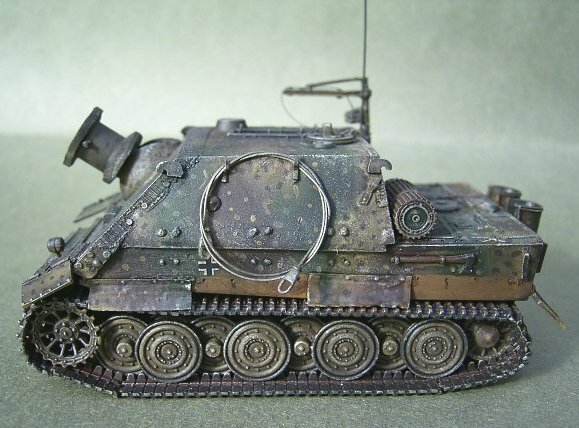 My model is constructed of a MR Modellbau resin set (see in-box review elsewhere in this site) which is mated with a Revell late Tiger E lower hull and wheel/track combo. 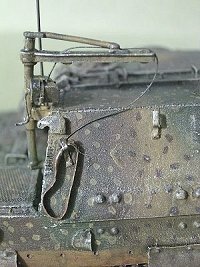 The MR Modellbau kit is very comprehensive and detailed, fitting well on top of the Revell hull. 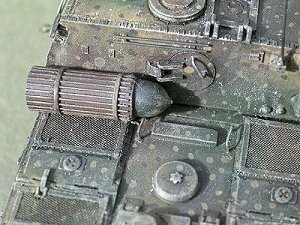 Especially the hull weld seams, the 380 mm mortar tube and the mortar projectiles are very convincingly done. Also the white metal parts, including the loading crane are very workable with some additional detailing. 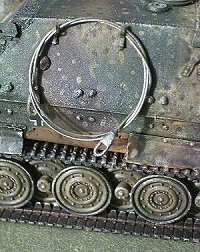 The mating procedure was overall quite an easy job to carry out, but required a fair amount of filing, sanding and putty filling. 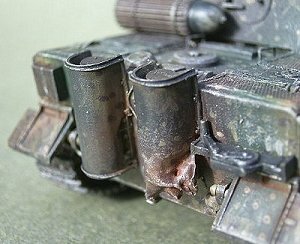 One particularly annoying part of the building process was the installation of the tracks because of the wide overhang of the upper body, and I did not succeed 100%. 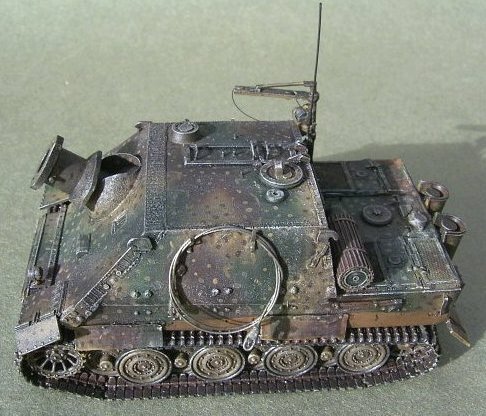 All parts of my model are from either of the kits (Revell & MR Modellbau), except for the engine intake grills (from a coffee brewer), some crane details, drivers visor, hatch handles, side hooks, side mud guards, lower part of the right exhaust cover, towing cable and antennae, all of which are more or less self made. 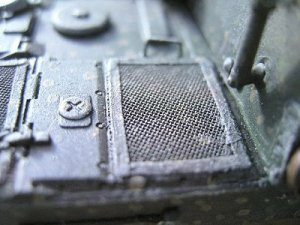 Also the fighting compartment side fringes had to be replaced with plastic strips, as the original resin edges crumbled away. Because of the high quality of both of the kits the final result looks accurate and is well detailed, while any roughness of the finishing is due to the lack in my own modelling skills. 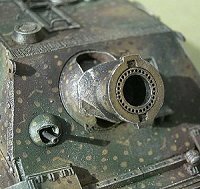 Sturmtigers were mainly used in the western front, which defines the painting to be a form of the Ardennes "ambush" camouflage. The markings are from my spares box and cover only balkenkreuzes as national insignia.